Today, on the NE corner of 12th Street and State, Emporia, is a church. The church, completed in 1948, replaced an extraordinary house, one of the finest in Emporia. 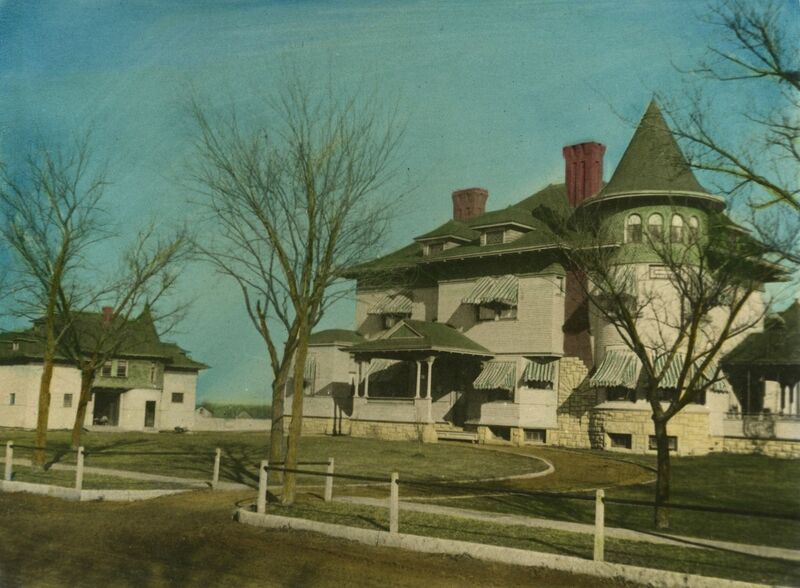 The house was certainly the work of architect Charles W. Squires, who designed more buildings in Emporia than any other architect. Squires designed my Cross House, hence my interest. The house was, I believe, built for G. W. Newman, who owned Newman’s department store in the city. The Newman House was comparable in scale to the Cross House. Today, the Cross House is the largest (by far) Squires-designed home remaining in Emporia. …and the lot in the 1890s. Can you believe this great thing of beauty was demolished? Note the huge arch to the right, and with the wide steps. Image ESU Special Collections and Archives, Walter Anderson collection. An early image. Image ESU Special Collections and Archives, Walter Anderson collection. As if the Newman house was not incredible enough, just look at its STUNNING carriage house! I am freakin’ out! I also LOVE seeing a carriage in the carriage house! The roofline, and its interplay of forms, is utterly exquisite; a work of art. Image Lyon County Historical Society. The house would have been brand new in this image. My heart just aches. Image Lyon County Historical Society. The same image, colorized. Image ESU Special Collections and Archives, Walter Anderson collection. The Cross House. You can see the similarities to the Newman House. Lovely winter scene. Image ESU Special Collections and Archives, Walter Anderson collection. The only interior image I could find. I would KILL for floor plans. Image Lyon County Historical Society. It pains me to look at the above images and know that this fabulous structure was just smashed to bits. Recently, somebody told me that many interior fittings were remove from the house, and installed in a new home in Emporia. Who told me this? I cannot remember. Which new house? I cannot remember. Simultaneously amazed and sad. Look at the retractable awnings in the first photo! How cool is that? I want one for my kitchen window. Would those awnings be removed for the winter? They sure would cut down on the light coming in those windows, which I’m sure was the intention during hot weather. 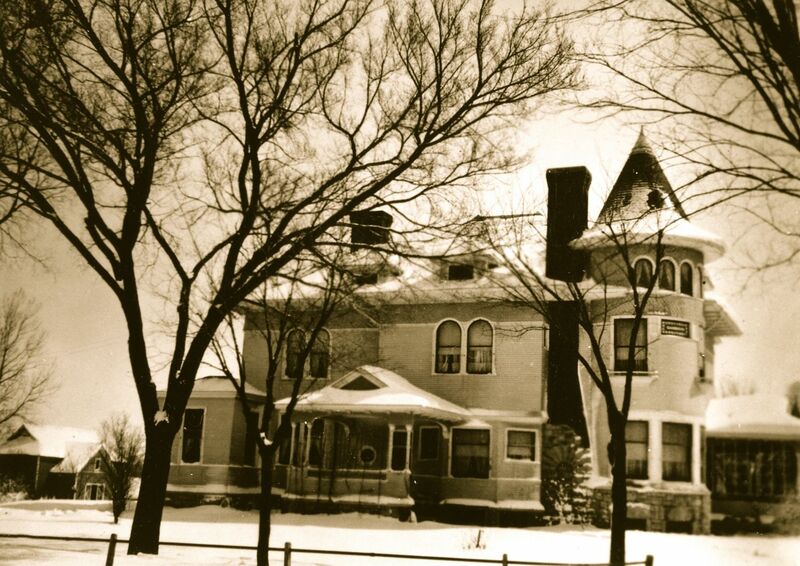 On the winter picture of the Newman House, it looks like the front porch is glassed-in. Is that what I’m really seeing? It was beautiful, that carriage house could have been it’s own house! I wish they understood what they were doing back then and would have built the church elsewhere. I wonder if any of the house parts ended up in the church? Does the church have a parsonage? So sad, is there any information why it was taken down . When will we as Americans stop destroying our past. The house was purchased by a church, and then demolished for a new church building. The Newman family had the first phone in Emporia. Why would anyone want the first phone, you might ask? Who would you call? The Newmans had the first two phones actually, one at the home and one at the mercantile downtown. I knew a descendent whose phone number was curiously 342-0001. When I noted the number would be easy to remember, Virginia told me the story on the first two phones and how the number had been passed down through the generations. 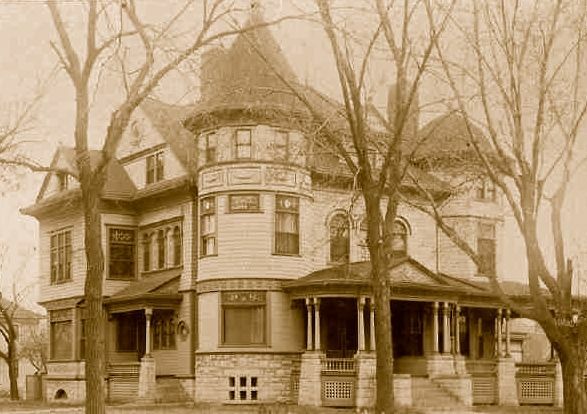 According to a July 26, 1900 article in The Emporia Gazette, the Newman home was designed by Harry Jones, a Minneapolis architect. However, the house was built by Dan Thomas, who also built the Cross house. 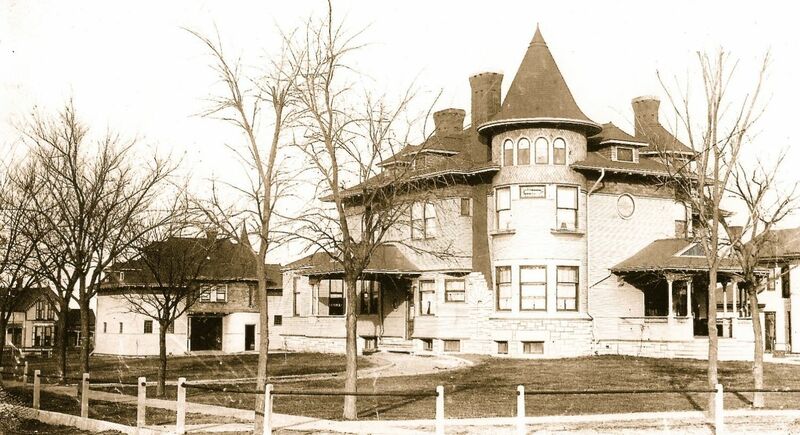 The Newman house was built in 1892 at a “cost more than $20,000.” The article includes interior photos of the front hall, dining room, and library. Warning: the photos are not distinct. G.W. Newman died in 1919. Mrs. G.W. Newman died in the house in November 1936. Her daughter Bertha Sprague and Bertha’s daughter Virginia remained in residence for almost two more years. The Warren Mortgage Company (which had ties to the Newman family) offered to sell the house for $7,000 in June 1938. Its assessed value was $16,200. 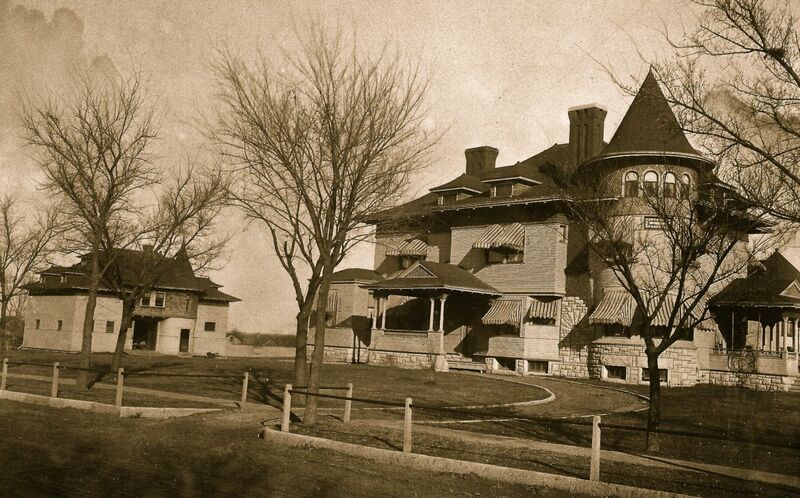 The house had been vacant for six months in 1938-39 when the Newman heirs leased it to the National Youth Administration of Kansas as a “resident training center for girls.” The NYA continued to lease the house until sometime after 1941. 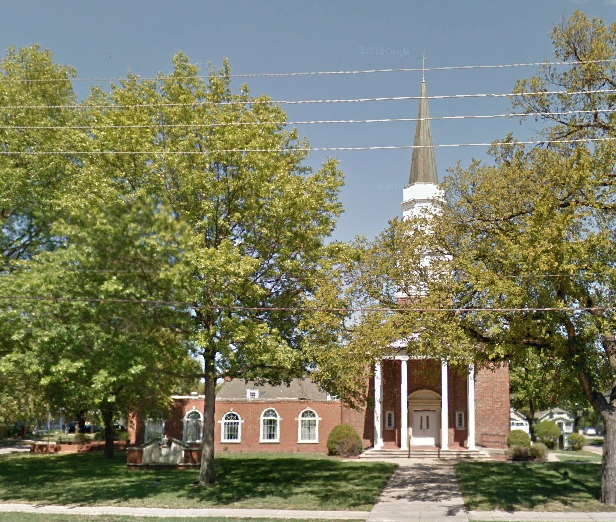 The Emporia Gazette reported members of the First Congregational Church voted to purchase the property from the Newman family in January 1945. After the war, a new church would be built on the site to replace its former location at Eighth and Mechanic that had been destroyed by fire in December 1942. The church board of trustees advertised a sealed bid sale of the Newman house and carriage house in March 1945. 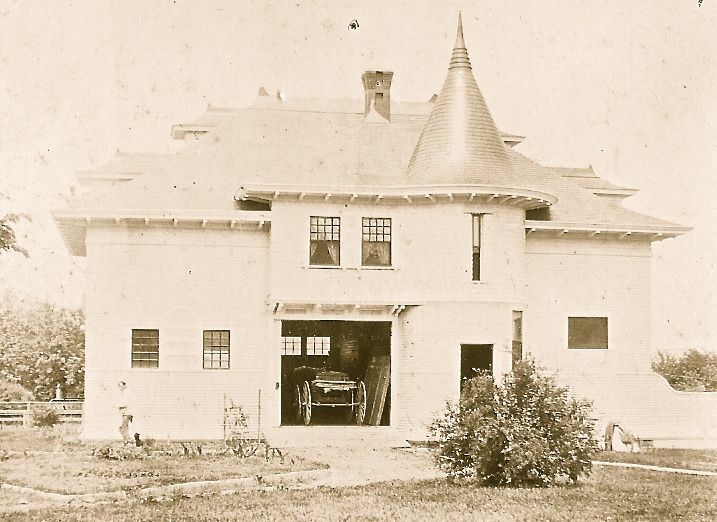 The carriage house was sold to Albert Jeannerett and George Humphrey for salvage. The house remained unsold. The church then leased the house to the Sigma Sigma Sigma sorority for one year. The sorority planned to occupy the house in September 1945. That fall, Don Johnson, a bookkeeper at the Kansas Soybean Mills, Inc., announced he had purchased the house and would salvage materials for use in his new home. The carriage house was removed before November, and the house was completely razed by June 1946. 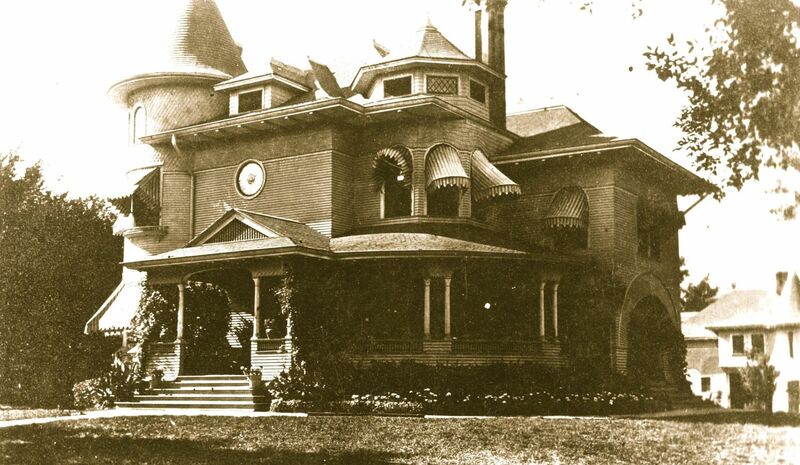 Johnson built a Colonial style home, designed by Brinkman and Hagen, at 1704 Berkeley. A feature story in the February 22, 1947 issue of the Gazette reported “one of Emporia’s finest post-war homes” included oak paneling, inlaid wooden floors, a marble fireplace, red cherry mantel, and built-ins removed from the former Newman home. In 1952, the First Congregational Church obtained a hand-carved cherry mantel salvaged from the Newman home and had it installed in its dining hall. 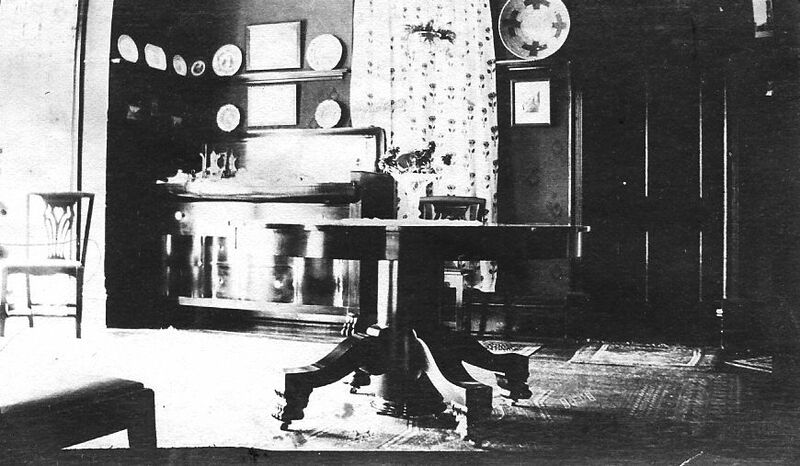 The mantel was highly prized by the congregation because it had belonged to Mrs. Newman, one of the Emporia church’s founding members. Steve! You are a brat! You offer all this incredible information…but with NO links to the sources described! Also, the house has so many signature Squires elements, I am doubtful as to its attribution to another architect. But I remain open to being wrong! And I am making a beeline to 1704 Berkeley! Hum! I’d like to know the verdict. Now that this novice looks at the two houses again, the Newman house looks like it could be a Squires knock-off. I admit, all I know about Squires I learned from you, Ross, but the Newman house just doesn’t’ have the same grace and grandeur as your house. Newman’s house is somewhat clunky and boxy by comparison. Plus the integration of graceful flourishes are lacking. The Cross House will always stand as the reigning queen of Emporia in my opinion. The Newman Home was built two years earlier than the Cross House. There are two houses by Frank Lloyd Wright. One is the Tomek house, finished in 1906. It is a fabulous design…but not quite right. Three years later, Wright took the same basic design…and did it brilliantly: the famous Robie House. Ah yes! That makes sense! Practice makes…well never perfect, but progress towards perfection.